Contents: One Toy Story Slinky Dog. Slinky Dog is based on the character from the Disney Pixar, Toy Story, films. He is one of the most loveable Toy Story characters! Usually just called 'Slinky' or sometimes 'Slink'! He has a dachshund face with a metal Slinky for a body! Children will love to recreate the Toy Story scenes with their very own slinky. Just pull him by his 'lead' and watch him walk in his unique Slinky Dog way! 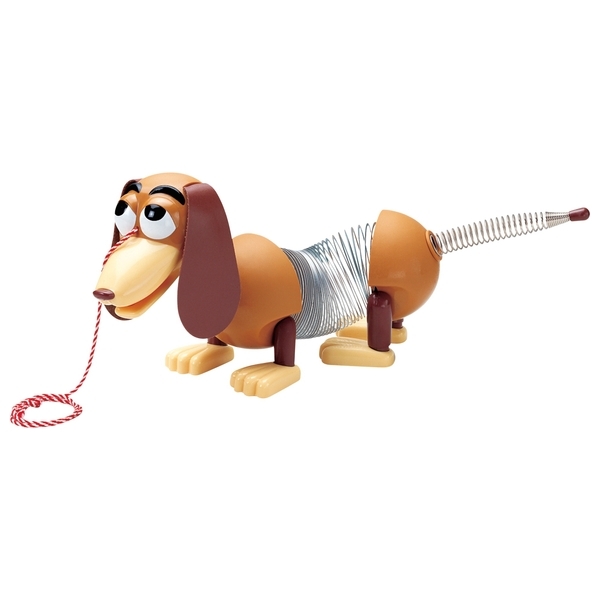 This adorable Slinky Dog comes complete with tail, adorable floppy ears and pull along cord perfect for taking Slinky for a walk. EU Warning: Not suitable for children under the age of 18 months due to small parts which could cause a choking hazard.